Much as newcomer Nina Arianda became the rising star of Off-Broadway last year with her blazing performance in David Ives’s “Venus in Fur” (now on Broadway), no actor has generated more buzz this season than Steven Boyer for his turn in Robert Askins’s “Hand to God.” The play, produced by Ensemble Studio Theatre’s writers-under-30 division, Youngblood, earned some rave reviews and an extended run when it opened last fall. Now it’s playing another five-week stint at EST’s tiny second-floor 75-seat house, best-known over the years for its prestigious one-act marathon. 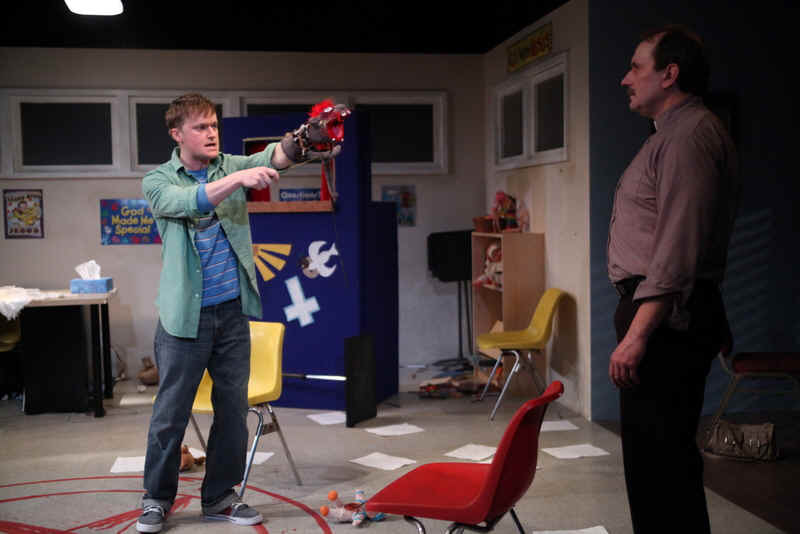 Askins’s comedy revolves around the sock-puppet workshop that recent widow Margery (Geneva Carr) runs out of the basement of her Lutheran church in Cypress, Texas, in a desperate attempt to stave off loneliness, grief, and feelings of worthlessness. The workshop is reluctantly attended by three teenagers – Jessica (Megan Hill), who’d rather be studying Balinese shadow puppetry; loudmouth bully Timothy (Bobby Moreno), who’d rather be donating blood; and Margery’s son, Jason (Boyer), a mumbly mama’s boy who actually has talent but shies away from attention – and conducted with the support and encouragement of Pastor Greg (Scott Sowers). It turns out that Pastor Greg is hot for Margery, who’s not hot for him. Timothy, unexpectedly, also has the hots for Margery, who won’t have anything to do with him until, suddenly, she decides to go for it. And, not to be left out, shy Timothy has the hots for Jessica, which we only learn from Tyrone. Have I mentioned Tyrone? That’s the sock-puppet alter-ego who inhabits Jason’s left hand – or should I say possesses his soul? – and spouts the kind of outrageous, potty-mouthed, unfiltered banter that Jason himself would never say. Boyer does indeed do an amazing job of seamlessly playing both recessive Jason and unleashed Tyrone, maintaining their distinctions as well as an ambiguity as to whether he’s truly possessed or simply passive-aggressively letting the puppet speak his mind. As for the rest of the play….sheesh. Clearly, there’s an audience for super-broad comedy recycling soap-opera clichés with cheerful dirty-mindedness, created and/or fed by cheesy network sitcoms, cretinous reality TV shows, and unrepentant stereotype-mongering Southern-gothic comic melodramas like “Sordid Lives.” Presumably, that’s the audience director Moritz von Stuelpnagel has encouraged his actors to play to. They dutifully conform to the Everybody’s Retarded School of Comic Acting, in which no gesture can be exaggerated enough and no line can be shouted too loudly. There were definitely people laughing their heads off, but surely others in the audience were suffering in silence like me. Aside from Boyer’s bipolar star turn and Rebecca Lord-Surratt’s witty economical scenic design, I found the rest of the show excruciating.